Allegations of corruption are shaking the government of Mariano Rajoy in Spain, spooking investors. Political risk has returned to haunt weaker members of the eurozone after a banking scandal in Italy and corruption allegations in Spain spooked investors. Spanish and Italian stocks and bonds fell and the euro retreated from recent highs against the dollar Monday as political uncertainty in both countries raised the risk of a retreat from painful reforms aimed at restoring financial stability. The banking scandal in Italy has reduced the chances of a clear electoral outcome in three weeks, and allegations of corruption are shaking the government of Mariano Rajoy in Spain. The FTSEMIB index of leading Italian shares and Spain's IBEX-35 suffered the sharpest falls in a broadly weaker European market, dropping 3.3% and 2.4% respectively. The cost of borrowing for both countries also went up as the yields on their 10 year bonds rose. The euro slipped against the dollar to $1.3571 after rising above $1.37 late last week, its highest level in over a year. Market confidence in peripheral eurozone states was restored last year by a combination of aggressive action by the European Central Bank and the steadfast commitment of governments to push through savage spending cuts and tax rises that have deepened the region's recession and sent unemployment soaring. More pain is due this year if countries such as Italy and Spain are to hit their tight budget deficit targets. "The [Spanish] scandal in combination with the upcoming political elections in Italy is likely to increase the perception of political risk in the region," Nomura economists wrote in a research note. Rajoy denied on Saturday allegations that he and other leaders of his conservative People's Party had received secret cash payments from a fund operated by the party's former treasurer. 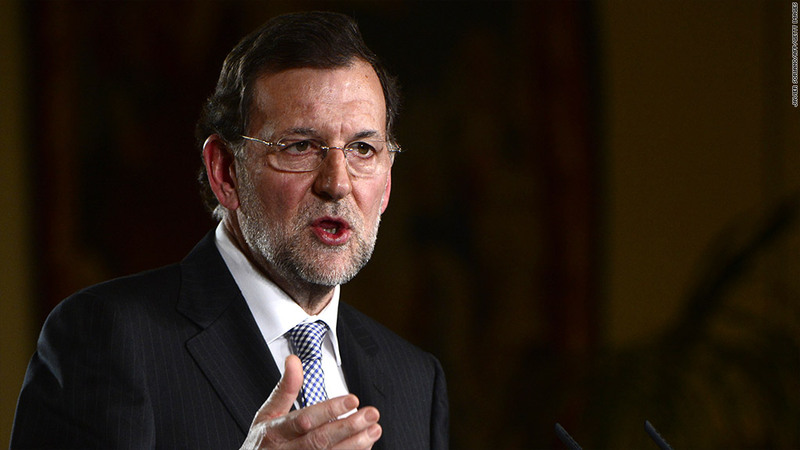 Rajoy said he would publish details of his personal wealth and income tax states on the prime minister's website. In Italy, former prime minister Silvio Berlusconi has sought to take advantage of the centre-left's involvement in the Monte dei Paschi banking affair. Berlusconi announced a raft of populist tax measures as he bids to defeat frontrunner Pier Luigi Bersani and potential coalition partner Mario Monti, who steered Italy through the worst of the eurozone crisis at the head of a technocrat government. "Markets already have to contend with an Italian election this month but the removal of Rajoy and his party would undermine the fiscal consolidation currently underway and ultimately lead Spain toward a bailout," said Ishaq Siddiqi, market strategist at ETX Capital. "Rajoy is already falling behind in the polls and further civil unrest could lead the rise of leftist parties, similar to the situation in Greece last summer." Spain has managed to avoid asking for a sovereign bailout from its European Union partners, but has turned to them for help to bail out its banking sector after the collapse of a real estate bubble left many institutions insolvent. The International Monetary Fund said Monday the country had made major progress in reforming its financial sector, and that the bulk of the measures agreed as part of the banking rescue had been completed. But it underscored the need for further vigilance. "It will be important to maintain this momentum with strong completion of initiated reforms and continued vigilant oversight, as risks to the economy and hence to the financial sector remain elevated as Spain undergoes a difficult process of fiscal and external adjustment," the IMF said in a statement. The nationalization of a Dutch bank on Friday also reminded investors that the health of the European banking sector is still far from sound.